Kingston The last several days it feels like I have been reliving the organizing we did through the Wal-Mart Workers Association and WARN (Wal-Mart Alliance for Reform Now) from 2004 through 2008, largely in central Florida and California. That experience was the heart of the discussion with our brothers on the national Steelworkers staff and an hour long interview and background briefing for a Nation reporter trying to assess organizing efforts and impact on Wal-Mart for a coming feature. With the support of the Atkinson Foundation we are launching several pilots in 2012 in Toronto through ACORN Canada to test out alternative labor organizing models and foundations, so I found myself directing a workshop for a couple of hours in Kingston, an historic and pretty old town along the St. Lawrence River, with the ACORN Canada new organizing staff in Ottawa and Toronto. With Wal-Mart too often again in my mouth and mind, I should not have been surprised to see a long piece on their massive retrenchment on healthcare for their workforce reported in the New York Times by Steven Greenhouse and Reed Abelson. In recent communications with their workforce (“associates”), Wal-Mart lowered the boom by eliminating any access to healthcare insurance for any worker averaging less than 24 hours per week – and from our experience that would be a vast majority of their 1.4 million workers! Additionally for employees who remain eligible the costs went up marginally on a weekly basis but the co-pays and deductibles went through the roof, sometimes moving from $1000 to as high as $5000. Under the new Wal-Mart plan if you smoke, you croak. Any admitted smokers would be required to pay additional huge premiums. Other incentives that Wal-Mart (and may other large corporations) had supported to encourage coverage or savings for health care were substantially reduced or eliminated. 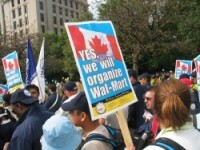 Wal-Mart’s argument was straightforward and simple: it’s their economy, stupid! Premiums had gone up and their profits were flat in the recession, so it’s so long, Charlie, and goodbye. Will it hurt their workforce? Hell, yes!!! Was that a factor, hell, no! The company, which had been glad to herald its expanded coverage several years ago (though we questioned the veracity of their reporting! ), now was very close mouthed about how many people were affected and how many would remain covered and actively insured. Relatively speaking, I would bet from our experience that the numbers would plummet to less than 10% of the hourly, non-supervisory workforce, though Wal-Mart is always slick about the way it merges the salaried and supervisors into all figures about average wages and healthcare coverage. Greenhouse indicated that some of the material on this change was supplied by OUR Wal-Mart (Organization United for Respect at Wal-Mart) and was clear that part of the original “reform” by Wal-Mart had been the result of widespread labor and community pressure, but it seemed to me that the company was once again reminding all of us how transient our efforts had been in the past and how irrelevant current programs like OUR Wal-Mart are to them in their current calculations. Those of us who worked to organize Wal-Mart in recent years at least liked to try to rationalize all of our work by hoping that we had created the leverage that had led to some reforms, even if we thought the leverage was sold short and stubbed out when it could have yield more dramatic results. An advocacy and communications campaign with a company as large as Wal-Mart certainly has some value, and ACORN International continues to aggressively and substantially support the work in India of our India FDI Watch Campaign which has kept Wal-Mart and other big box retailers bottled up and at bay on their expansion efforts in this huge market, so we understand why it is important. Nonetheless Wal-Mart seems not to mind rubbing our noses in the dirt and reminding us that without deep and permanent organization inside the company of their workforce, the rest is just public relations and politics to them, entered based on their will and exited at their whim. For all of the smoke and mirrors, sound and fury, unless there is a sustained, permanent effort to create a viable and internally powerful workers organization at Wal-Mart, the worlds’ largest private sector employer, nothing will check the ability of this company to give and take away based on whatever it deems expedient. That simply does not work for its workforce, and when the giant roars others will follow, so the big footprints of the company will be dug deeper by other large and small firms moving to curtail benefits and protections in the wake of this action. The company cannot be organized “old school,” and the UFCW and others have not yet mastered how to mobilize the resources, support, and commitments to successfully create the infrastructure that will build organization inside the company for the long term. Wal-Mart keeps throwing down the gauntlet and proving one generation of labor leaders after another that they have the staying power and that any deals with them are temporary and contingent. It’s all about them and the devil take the hindmost. We need to make a commitment to organize this company come hell or high water, and finally mean it, not for a couple of budget cycles but until the job is done. This entry was posted in WalMart and tagged ACORN Canada, Atkinson Foundation, big box, Reed Abelson., steven greenhouse, wal-mart, Wal-Mart Alliance for Reform Now, Wal-Mart Workers Association by wade. Bookmark the permalink.